Has anyone built a roll cage for the Reeper? 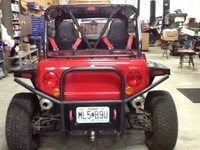 I'm getting the itch to start working up a simple sport cage like the one in the pic I have on my Jeep. 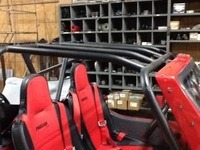 It's a front hoop, windshield bar and tie to the existing roll bar in the back using 1.5" and 1.75" .95 wall DOM tubing. Any thoughts? Actually there is one in southern Mo.that caged his. I'll try to download a pic of it. Found it on Craigslist for Springfield Mo. If you want more info. U have any more pics of that tj? I found this surfing through images on yahoo. Has to be the same car. The cross bar in the back has been welded with gussets. Still need a pic of the front hoop. NCIS would be proud!! Ive been planning one for a while, Just got a little lazy on weekends since works so busy. Ive planned to remove all the factory cage and start over from scratch. New main hoop 1" taller than stock, new 1/8th thick base all the way across with harness tabs welded on. Ive decided on doing the jeep style to ease installation concerning bends. From main hoop to front will be to plates bolted to windshield frame on both sides, then down thru dash to 6 x 6 plates just above body mounts, rear will be same design as factory but go from hoop into bed area above body mounts on plates welded in. Im also going to use Balistic Fabs ID tubing clamps in both a pillar bars and rear bars to facilitate removal of entire cage if needed. Ill post a couple pics of rough idea. does the windshield frame offer any rollover protection? are there any pics of the carnage after a rollover? No Im sure It does not, Just like a Jeeps does not, But its the A pillar support bar that does. Down thru the dash to just above body mount. My biggest concern with these IS the fact that the rear hoop, your main protection, rides on a thin plate mounted to thin sheet metal over a cavity that can crush below it. BTW yes there where Carnage pictures of a roll over with the factory bars in place but from what I understand its long been removed at the urging of Lawyers relating to the incident. I personally am going to go thru the plate and body down to the frame or/mount welded to frame as needed in this case. 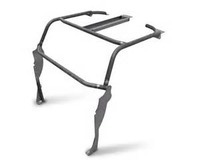 The roll bar mount on the back should be strong enough - like Dragin331 said above most race car cages and roll bars are mounted to the floor sheet metal on 6x6 plates, not tied to the frame. The stock roll bar in my Jeep is that way and weighs well over #3000 with all the stuff I have on it - more than adequate in pics I've seen of rollovers at highway speed. The windshield frame is the weak point. I added the sport cage shown in the first pic, also tied into the body right below the dash. I am worried more about the Reeper windshield frame, but the it is boxed and continuous down into the body. My fear is based on the Jeep, may not be an issue with the Reeper. have been looking at producing a front hoop following the windshield frame and that would tie in to the center stock support. The best path would be to have it pass through the dash which would require drilling holes for it to pass through. This way it could be bolted directly to the body mounts below the dash. My problem has been getting through tax season and paying up uncle sam before investing in a tubing bender. Now that that is done I will be looking into investing in that area. I am looking at 1.5 DOM tubing with smaller side tubes above the door frame to aid in tightening the top as well. Just working on freeing up the time now. If interested contact me at beaveroffroad@gmail.com so I can get an accurate count on the number of interested people. This style would allow for best pricing while still being very strong for personal protection. I'm in, need to set you up on auto pay - I have a tube bender, but dont want to pull the dash out yet. I'd rather see you do it!! Hope to have my tubing bender in the next week or so. Will start working on the cage once I get it set up. Shouldn't need to pull the dash with what I am designing and planning. It will however need a couple holes drilled through it at each end for the tubing to pass through to the front body mounts. The back roll bar system seems intact, I am going to pull mine off and gusset the center section. The windshield frame actually faired pretty well, better than expected but I'm not going to leave it alone. Scott(aka the Fool)- Beaver Offroad needs to put the cage on the front burner - too bad winter is over and you're not still froze in. I'm a believer in a front hoop and windshield bar! You are extremely lucky per the other thread - thanks for sharing the pics. I will be doing a cage upgrade or replacement as soon as time allows. I will post pics before, during and after. I am hoping to have the upgrade worked out by mid July. There was an issue with getting the new tube bender I was ordering. The one I am working on would have helped with the roll over pictured above. Not saying the windshield frame wouldn't have still received damage, but wouldn't have suffered as much. And this is a top issue. Matter of suppliers messing up. I received my tubing bender, hydraulic, this week. I will be off on vacation for the next two. After that this will be a BOR priority. Keeping in mind I do work a regular job and that I will also be working 2 weeks continuous when I return from vacation. Have to cover the other folks. I will still have time to work this in. The design is pretty set and straight forward. It will require a couple proto types with the new bender. 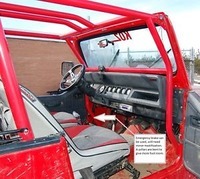 It will provide windshield frame strength, or more in line of front support as well as added side support that will also aid in making the stock tops fit much better as well by creating support above the door area. For now though. The Fool needs some much needed down time. Also the roll bar I am working on will use the under cab body mounts to the frame and attach to the stock center tubes where they currently attach to the winshield frame. I didn't see details of the way or speed at which you rolled, but it does look like it survived better then I imagined one would.